Meanwhile, Man Ray has found two humpback whales who were willing to carry April and the Turtles back to America, and they arrive at New Orleans. The whales drop the heroes off on a half-sunken ship that has hit a reef offshore. Everyone dives into the sea and begins to swim towards shore when they spot two shrimp boats dropping nets. Ray explains that the nets are supposed to be equipped with a device that will allow sea turtles and other larger animals to escape. April is interested in the process and asks Man Ray to show her how it works, and the former scientist agrees. Ray swims with April on his back up to the nets, but shockingly discoveres that these nets do not have the proper extruder devices. This enrages Man Ray and he swims to the surface and demands that the shrimpers pull up their nets. Not surprisingly, the captain of the boat tells Ray to buzz off, but the mutant isn’t happy with this reply and attacks. Unfortunately for the zealous Ray, he is quickly captured in a net and beaten into submission. April swims back to the Turtles to let them know what’s happened. The TMNT are back on board the abandoned ship, where Master Splinter has finally managed to contact them via astral projection. Splinter is pleased to discover his sons are doing well and experiencing so much of the world. As Splinter’s image fades, April arrives with the news. Later, the Shrimpers pull up their nets expecting to see a rich booty of shrimp, but only find trash and debris. The Turtles appear on the back of a giant turtle, wearing costumes and trying to pass themselves off as vengeful turtle spirits. The act fools one of the crews and they abandon ship, but Cap’n Mossback is unimpressed and fires a harpoon at the turtles. 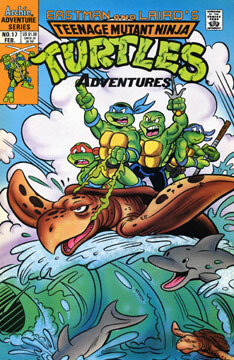 The TMNT dive into the water and climb aboard Mossback’s ship, where a battle ensues. April uses the diversion to free Man Ray, who crashes through the deck and frightens Mossback into falling overboard. To everyone’s surprise, the captain can’t swim and soon sinks beneath the surface of the water. No one is in a hurry to rescue the pirate, but soon the giant turtle that the TMNT had arrived on surfaces, with the captain safely on its back. Back in New York City, The Kid arrives at Null’s headquarters to report his failure in tracking the Turtles. Null is angry, and introduces Kid to his new business partners… the insect warriors Skul and Bean!